Strawberries are well suited for planting in the home garden since they produce fruits very quickly and require a relatively small amount of space. Each plant may produce up to one quart of fruit when grown in a matted row during the first fruiting year. June-bearing cultivars typically produce fruits during the second year of planting while everbearing and day-neutral cultivars produce fruits during the first year of planting. Figure 1. Fresh strawberries are delicious and have many health benefits. Photo by Ken Chamberlain. Twenty-five plants will normally produce enough strawberries for an average-sized family. More plants can be ordered and planted since strawberry plants are relatively inexpensive. Excess berries can be turned into jam or jellies. They can also be frozen for future use. A strawberry planting does not remain productive forever. The strawberry yield usually declines during the second and third years of fruiting; therefore, a new planting should be established after strawberry plants produce fruits for more than three to four years for maximum production every year. A strawberry bed also needs to be renovated after three years of fruiting to stay productive for one or two more years. Strawberry plants produce attractive fruit with fine flavor. Strawberries have a very high vitamin C content and are versatile as a dessert food. Most cultivars of strawberries are well suited to freezing and processing, as well as for fresh use. Many people enjoy eating the fresh-picked fruit. Strawberries are also excellent for jams, jellies and pies. Freshly sliced and sugared strawberries are excellent when served chilled either alone or over shortcake or ice cream. In addition, strawberries contain many antioxidants, which have anticancer properties. Strawberry plants can be divided into three types, June-bearing, everbearing and day-neutral. June‑bearing plants are cultured to produce a full crop the season after planting. In Ohio, the ripening season of June-bearing strawberry cultivars ranges from late May to the end of June. Everbearing cultivars are capable of producing a crop in the year of planting and can produce two smaller crops, one in late spring and the second in early fall. The day-neutral plants are capable of producing fruit throughout most of the growing season. Figure 2. 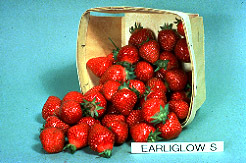 Earliglow is one of the best tasting strawberry cultivars. It is also disease resistant. June-bearing types are most popular for the home garden and commercial use and are well worth waiting for because of their high yields, outstanding flavor and quality. One cannot tell by looking at the plant whether they are of the June-bearing, everbearing or day-neutral type; therefore, when purchasing plants, it is important to specify which type is desired. It is certainly a good idea to plant both types to get fruit production in the first year from day-neutral strawberries, and high yield and quality from June-bearing strawberries. A main portion of the plants should be of June-bearing type while other two types can extend the harvest season. Home fruit growers have a large number of cultivars (varieties) to select from. The selection is much greater for the June-bearing types than for the day-neutral types. Strawberry cultivars suggested for growing in Ohio are listed in Table 1. Table 1. Cultural Characteristics of Suggested Strawberry Cultivars. Note: New fruit cultivars that may be superior to currently suggested varieties are constantly being released. Check with your local Extension Educator or the nursery you order plants from to obtain information on newly released cultivars for your location. It is important to know the ripening season, yield, berry size, freezing quality and dessert quality of suggested cultivars in order to select cultivars according to personal needs (Table 1). In addition, selecting disease resistant cultivars will help growers reduce the risks of damage from plant diseases (Table 2). Refer to Table 2 for the disease resistance of the suggested strawberry cultivars. Home strawberry growers are encouraged to check the references listed or talk with Extension Educators or local commercial strawberry growers for additional information about strawberry cultivars. Table 2. Disease Resistance of Suggested Strawberry Cultivars. 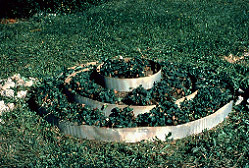 S = susceptible, VS = very susceptible, I = intermediate reaction, R = resistant (the disease does not occur on that cultivar or only to a very small degree), VR = very resistant, T = tolerant (the disease is clearly evident, but with little or no apparent detrimental effect on plant or yield), U = unknown. *Cultivars are only resistant to specific races of the red stele fungus. If races for which resistance genes are not available are present in the planting or are introduced into the planting, red stele can develop on “resistant” cultivars. Strawberry plants require full sun for the maximum yield and the best quality. They will grow and produce crops in several different types of soil. However, best results are obtained when the plants are grown in loose, fertile soils containing large quantities of organic matter. The soil should be slightly acidic, having a pH of 5.8 to 6.5. If the extent of soil acidity or fertility is unknown, it is suggested that the soil be sampled and tested. Arrangements for soil testing can be made through your county Extension office. Request special tests for organic matter and boron. Lime and fertilizers should be applied to soils according to soil test results. The strawberry plant is sensitive to excessive soil moisture. Strawberries should be planted in raised beds or on ridges if drainage is a problem. Also, avoid planting strawberry plants in areas where potatoes, tomatoes or sod were grown recently. Insect and disease problems may result in serious plant damage in such areas. Important cultural practices for growing strawberries include planting techniques and spacing, weed control, proper fertilizer, blossom removal, irrigation, renovation of strawberries after harvest, insect and disease control, and mulch for protection from cold temperatures and diseases. Figure 3. Diagram of a strawberry plant. 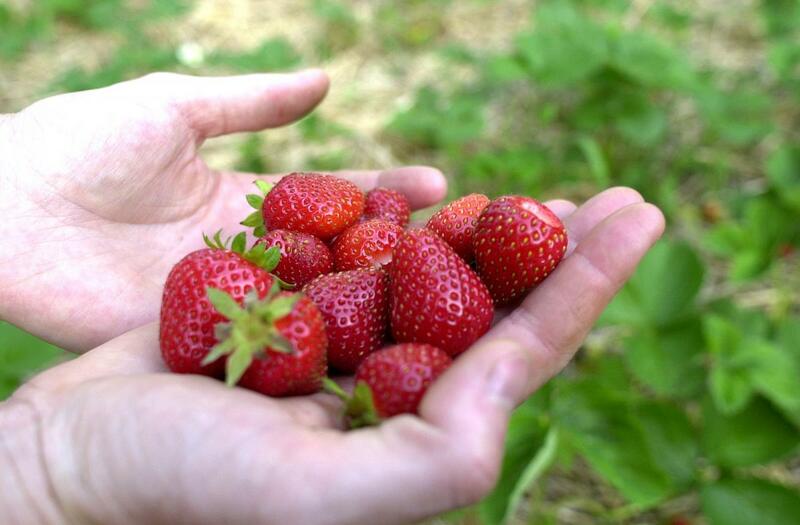 Early spring is the best time to plant strawberry plants as long as soil is not too wet. Fall planting is not recommended because plants can be injured by soil heaving (alternate freezing and thawing). 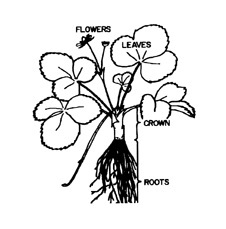 Strawberry plants have roots, a crown and leaves (Figure 3). The crown is a short stem between the roots and leaves. When planting, make sure to cover the roots and only half of the crown with soil. Make a trench deep enough to set the roots vertically. Do not bend roots horizontally. June-bearing plants are spaced 12 to 24 inches apart. On close-spaced plants, runners are controlled by removing unwanted runners during the first season. In August, rows should be 18 to 24 inches wide with plants 6 to 8 inches apart in the row. Generally rows are 36 to 40 inches apart. A circular terrace can be used if one has limited space (Figure 4). For day-neutral strawberries, plants are set 8 to 12 inches apart in the row with 30 to 36 inches between rows. Remove runners throughout the first season and remove flowers for the first 6 weeks after planting. Mulch the planting with 3 to 4 inches of straw or wood chips to conserve moisture. Mechanical cultivation, mulching and certain herbicides are suited to maintain essentially weed-free planting. Mechanical cultivation and mulches are recommended. Figure 4. Strawberries in a circular terrace. Soil testing every two to three years is highly recommended for the best yield and quality. Apply nutrients and lime (if needed) prior to planting according to soil test results. Apply 1 ounce (10 oz. 10-10-10) of actual nitrogen broadcast per 100 square feet of plant or 0.5 ounce (5 oz. 10-10-10) band 4 to 6 inches away from the plants seven to 10 days after planting. Apply 1 to 1.5 ounces actual nitrogen broadcast in mid-June if rainfall has been excessive and again in mid-August. In the fruiting years, apply 1 to 1.5 ounces actual nitrogen broadcast after harvest and again in mid-August. Remove the flower stalks of June-bearing strawberry plants as they appear throughout the first growing season. More production can be expected if the plants are allowed to attain large size before fruiting. Remove the blossoms of day-neutral types of plants as they appear until about the middle of June (first year only). Then allow flowers to set fruit for harvest during the remainder of the season (August through October). Additional watering is needed during dry seasons. Plants require 1 inch to 1.5 inches of water per week from mid-June to mid-August. Take care in watering so that the soil does not remain soggy for any prolonged period. Figure 5. Strawberry patch right after renovation. Strawberry plants can be fruited more than one year but probably not for more than three harvest seasons, depending on the vigor and number of plants. June-bearing strawberries should be renovated every year right after harvest if one desires excellent fruit production for more than one year. First control weeds by mechanical means or labeled herbicides. Remove all old leaves with a mower or a sickle. Make sure to set the mower as high as the blade will go to avoid injuring plant crowns. Narrow the rows to a width of about 12 inches by cultivating between them with a rotary tiller. Thin the plants within each row, leaving 4 to 6 inches between plants. Topdress beds with 0.5 to 1 inch of soil. Broadcast 2.5 pounds of 10-10-10 fertilizer per 100 square feet of planting. Apply 1 inch of water each week to promote growth if it does not rain. 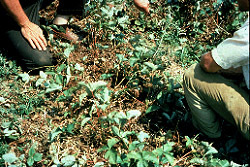 The strawberry patch may look very depressing right after renovation (Figure 5). However, strawberry plants do recover beautifully (Figure 6) and will be much more productive. Figure 6. Strawberry patch one week after renovation. Many problems due to insects and diseases in the home garden can be avoided by selecting sites where sod, tomatoes or potatoes have not been recently grown; planting disease-free and disease-resistant planting stock; and using good cultural practices. For additional information on insect and disease management, refer to the OSU Extension Bulletin 780, Controlling Disease and Insects in Home Fruit Plantings. In addition to value for weed control, mulching is necessary to provide winter protection for the plants. 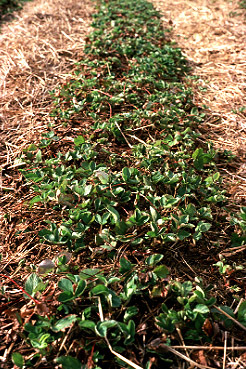 Apply straw that is free of weed seeds 2 to 3 inches deep over the plants after they have been subjected to several sharp freezes in the low 30s or high 20s in fall. This is generally between November 15 and 30, but no later than December 15. Strawberry flower buds are very susceptible to spring frosts. Mulches used for winter protection should be pulled from plants in early spring, before there is much leaf yellowing. The mulch should be left in the alleyways and can be used to cover blossom in the spring when frost is predicted, especially with early cultivars, such as Earliglow. Frost protection could be the difference between a good crop and no crop. Home gardeners are encouraged to purchase a copy of the OSU Extension Bulletin 940, Midwest Home Fruit Production Guide and Bulletin 780, Controlling Disease and Insects in Home Fruit Plantings from their county Extension office for additional information on fruit production in home plantings. Ellis, M, and C. Welty. 2010. OSU Extension Bulletin 780, Controlling Disease and Insects in Home Fruit Plantings. Columbus, OH: The Ohio State University. Gao, G., R. Becker, M. Brown, M. Ellis, S. Prochaska, C. Welty, and R. Williams. 2017. Ohio State University Extension Bulletin 940, Midwest Home Fruit Production Guide. Columbus, OH: The Ohio State University.